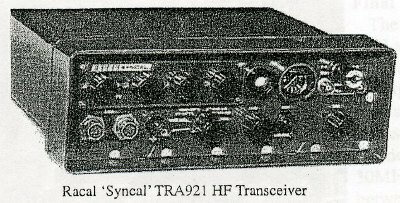 The TRA921 'Syncal' was Racal's first HF manpack to have synthesised control of its operating frequency and followed directly from the huge success of 'Squadcal' described in our last issue. The history of its origin is of interest; the British Government had placed contracts with BCC, Plessey and GEC for the development of the Clansman range of tactical HF and VHF radios for re equipping the British Army. The contract with Plessey was for HF manpack radios with synthesiser frequency control and for this Plessey had developed a thick film module. Racal had approached Plessey to see if they could purchase this for use in a new HF manpack for sales to Third World countries, but the price quoted was around 300 and this did not include the additional cost of engineering the module into a fully working 'frequency synthesiser capable of use in both the transmit and receive modes. At the time I had just completed the design of a programmable frequency synthesiser for use with a large HF communications system that had been sold to the Royal Canadian Air Force. This was a large piece of rack mounted equipment to cover the full HF band up to 30MHz and was based on analogue techniques throughout and not at all capable of adaptation for manpack use where low power consumption and compact construction were essential. 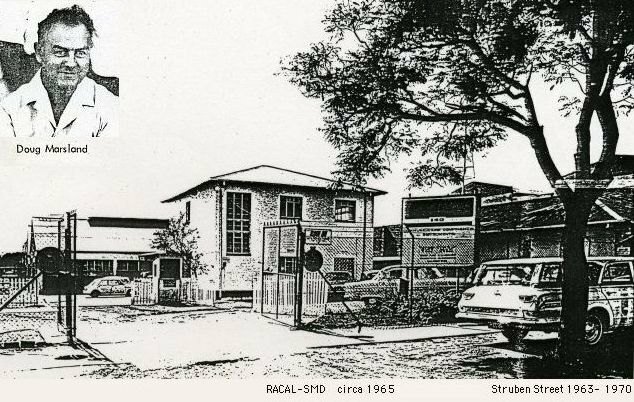 In mid 1966 I attended a meeting with the then Racal Chairman and founder of the company, Ray Brown (later Sir Raymond Brown), when the dilemma facing the company with its desire to produce a lowcost synthesised manpack radio to cover the frequency band of 28MHZ in steps of 1kHz. I made the somewhat rash statement that "It should be possible to produce a frequency synthesiser for less than £300. The Chairman immediately said "Go away and come back tomorrow morning and tell me how you propose to do this". Needless to say I had no sleep that night and worked through goodness knows how many sheets of paper to find a basic design for the frequency synthesiser. It so happened that the Fairchild Company had just produced a programmable decade digital divider in integrated circuit form. The only problem was that it had a maximum operating frequency of only 2MHz. However, this was an important start and with this I was able to come up with a basic scheme that had every chance of meeting the important design criteria for the synthesiser of low cost, small size, low power consumption, and capable of operating over the required frequency band (more of this later). A team was then set up to commence design of the radio with Jim Diggins responsible for the basic radio, assisted by John Killeen. I was responsible for the design of the frequency synthesiser and was assisted by Alan Cox. As prime design aims the marketing department had requested that the radio should have a selling price competitive with Plessey, Redifon, Thomson, Tadiran and Hughes. It had to be very reliable and given the likely applications in hostile environments, it needed to be easy to operate (this was because many of the users were likely to be poorly trained) easy to maintain and capable of use both as a manpack or in mobile installations. The final design was mounted in a fully sealed ABS plastic case with separate clip-on battery pack, and in its manpack form weighed only 4.5kg (l0lb). It covered the frequency range of 2 to 7.999MHz in 6000 channel steps of 1kHz, each locked to a precision quartz crystal frequency standard. Its operating modes were single sideband (upper or lower) and AM, and could be used for speech or Morse. 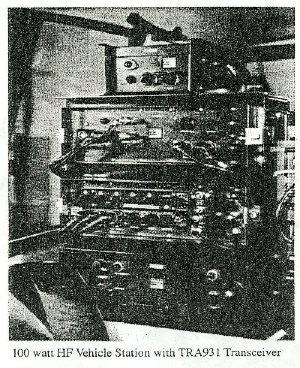 The transmitter was capable of an output power of 20watts PEP. There were four rotary switches for selection of frequency to give the MHz and kHz steps. In addition there was one control for optimum tuning of the main RF inductor in the inbuilt aerial tuning unit. The radio consisted of two main units in addition to the battery pack. These were the Transceiver Unit Type MA924 and the Synthesiser Unit Type MA920D. The transceiver was of conventional superheterodyne design with an intermediate frequency of 10.7MHz. The aerial tuning was by a large coil whose inductance was varied by a pair of ferrite cores that ran through the centre of the coil on a threaded screw and connected to a front panel control. In the transmit mode the speech from the microphone was first amplified and then passed through an amplitude clipper to a balanced modulator to provide a double sideband suppressed carrier IF signal centred on 10.7MHz. Depending upon the required transmission mode, the signal was then passed to one of an upper sideband filter or lower sideband filter and then to a double sideband filter (for AM, suppressed carrier, the signal bypassed the two sideband filters and went, instead, directly to the double sideband filter). For Morse operation, a 1kHz tone was used as the modulating signal, with the tone switched on and off by action of the key; the keyed signal was then passed through one or other of the sideband filters. The filtered output was then mixed with the local oscillator frequency (in the range 12.7 to 18.699MHz and then through a low pass filter, which selected the required transmission frequency in the range 2 to 7.999MHz. (For example if the required transmission frequency was 4.5MHz the local oscillator would be set to 15.2MHz, giving 15.2MHz 10.7MHz = 4.5MHz.) "The signal was then amplified and passed to the aerial tuning unit which was adjusted to give a peak reading on a meter). The power amplifier could be operated either on low power (5watts pep), or high power (20 watts pep). On receive the signal from the aerial was converted down to the 10.7MHz intermediate frequency by mixing it with the local oscillator frequency, it then passed through the appropriate filter for LSB, USB or AM and thence to a balanced modulator supplied with a 10.7MHz crystal derived frequency, and finally, via an amplifier, to the headphones. The only active components in the transceiver were transistors and diodes. There were no integrated circuits. At the time the Syncal radio was designed I was not aware of any manpack radio in production that had synthesiser control, and, for me, it was no small challenge to find a viable design. As I mentioned earlier it so happened that Fairchild had just put on the market programmable decade dividers, but these were limited to a maximum operating frequency of 2MHz. I decided, therefore, to adopt the design shown in the block diagram which consisted of seven principal circuit elements: a varactor diode tuned local oscillator covering the required frequency range of 12.7 to 18.699M.Hz; a mixer to reduce the output to the range 0.7 to 1.699MHz; a bank of six crystal oscillators of frequencies 12, 13, 14, 15 16 and 17MHz respectively; a variable digital divider using three of the Fairchild integrated circuits and adjustable from a ratio of 700 to 1699 to give a 1kHz output when phase lock occurred; a master 5MHz frequency standard; a reference generator driven from the frequency standard, with outputs frequencies of 10.7MHz. 1MHz and 1kHz; and a sample and hold phase detector whose output was suitably filtered and used to phase lock the varactor tuned local oscillator. 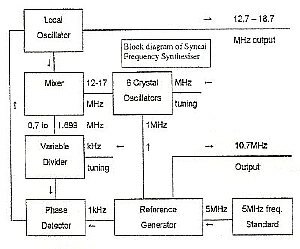 The 10.7MHz output was used for the modulators in the transceiver, the 1MHz output was used to lock the frequency of the six crystal oscillators and the 1kHz output was used as the reference frequency for the phase detector. variable divider would have to be set to a ratio of 1200. The sample and hold phase detector used a field effect transistor and the output voltage was stored between each sample in a capacitor (this was to prevent 10.7MHz any 1kHz pulses appearing at the output which would, otherwise, frequency modulate the oscillator. At this time (1966) there was almost nothing published on the design of phase locked oscillators with sampled types of phase detectors so we had to derive the theory from scratch. It was necessary to keep the overall loop bandwidth as high as possible to ensure reasonably fast control of frequency between each selected step and to help minimize oscillator noise. Another major problem was to avoid any feedback of the fast digital edges in the synthesiser from finding their way into the transceiver unit. which would otherwise play havoc with its performance. As a small sideline the actual production cost of the synthesiser unit soon fell below £70 quite a saving on the original target of £300. The radio finally went into production in 1967 and was available on the market in the following year. Like its predecessor, the Squadcal, it was a major success with total sales of approximately 10,000. Customer feedback indicated a need to extend the frequency range to cover 1.6 to 30MHz and to provide interpolation between the 1kHz steps in order to accommodate less stable receivers. There was also a requirement for high power mobile and fixed stations. These requirements led to a new radio named 'Syncal 30' and given the Racal type reference TRA931. By the late 1960s, new and improved variable digital divider ICs had become available, together with high power transistors capable of operating efficiently up to 30MHz. The TRA931 was first produced in 1971 and covered the 1.6 to 30MHz band in 284,000 channels spaced at 1kHz. Its frequency stability was better than 2 ppm over the operating temperature range of 25C to +55C. Like the TRA921, it had a single antenna tuning control, but its inductance was varied by a very clever system of winding the turns on and off the coil former onto a metallic shorting drum. A search control allowed fine tuning between the 1kHz steps. The TRA931 had a maximum output power of 20watts pep and 5watts in low power. For vehicle and fixed station applications there were 100watt and 400 watt power amplifiers, together with various others ancillary units. The photograph shows a 100watt vehicle station. Variants included a frequency hopping version, the TRA931XH, and the TRA931P with eight programmable channels. Altogether 58,000 TRA931s were supplied worldwide, including several thousand in kit form manufactured in Egypt at the Katron factory near Cairo. Except, perhaps, for the WW1I 19 Set, the TRA931 was the most successful HF military transceiver ever made. This, together with the earlier Squadcal and TRA921. were instrumental in the Racal success story.